Fiddler's Green overlooking Blacksburg. From here you'll see Lane Stadium and Virginia Tech campus down below and the view is spectacular. Enjoy fall football weekends and stunning mountain vistas. Fiddler's Green has it all. A 30 Acre Conservation easement is life insurance for your view. Now is your opportunity to own it. In life and in real estate, there's no substitute for perfect location and design. Boasting beautiful Villas designed by Balzer and Associates, and home sites that create harmony with the surrounding countryside, now is the perfect time to invest in Fiddler's Green. Blacksburg is developing, the Virginia Tech campus is growing and alumni are returning in record numbers. There's so much to do. 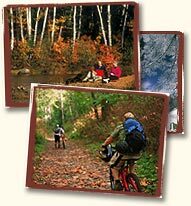 Nestled between the Blue Ridge and Allegheny mountains, nature calls with hiking, biking, camping and canoeing. Restaurants and clubs bring nightlife to the town. Lane Stadium comes alive with the roar of the crowd. Blacksburg is blessed with an agreeable climate, reasonable cost of living, good schools, and a genuine sense of community. There's great shopping, a vibrant arts scene, nearly 200 businesses and restaurants, Virginia Tech, and an award-winning transit system.